It's important to us that we remain one of the top landscape design companies and historic landscape preservation specialists in New England. Whether we've worked on a residential garden design project or served as a historic preservation specialist on a large public project, each commission is vitally important to our company. References are gladly given upon request. I have had the pleasure of working with Cindy for over twenty years. I applaud her for many reasons. First, she is a cheerful, energetic, warm person whom any one can work with. In spite of her long car trips, she bounces out of her car at early hours and is eager to carry plants..heavy ones..supervise landscape crews, consult, prune thread leaf maples, whatever is asked. She is never without a smile. Second, I appreciate her professionalism. She is extremely capable, knowledgeable, and is able to communicate information easily to "lay" gardeners. I am forever learning from her. She is respectful of her clients ideas and thoughts. Cindy is creative in her designs and has a way of tailoring her designs to the site and to the wishes of the client. She prepares plans, but is flexible on the job. If something does not work quite right, she is amenable to change. Consequently, her designs have freedom and expression. She delivers the unexpected rather that the conventional landscape designs. Cindy has seen me through construction of a new house, three weddings, and most recently the Lexington Garden Club Tour. She has been a part of my garden and she is beginning to work with my daughter. We love her for work and friendship!!! Our hope was for a landscape plan appropriate for our old saltbox home that complimented the Historic District of our town, could be reasonably maintained and incorporated some of our own interests. We also needed a great deal of help preparing the presentation to the Historic Commission. With Cindy, we found the process from beginning to end to be very educational and enjoyable. We couldn't be more pleased with the results ... which is why we called her immediately when we had the opportunity to reunite our home with the barn behind us, having been separated half a century ago. 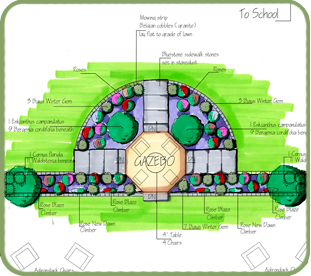 It was a pleasure working with Cindy on the master plan for our residential landscape design. My husband and I had never approached a project of this scale before, and it was so helpful to have Cindy guiding us through the steps and plans as we navigated these new waters. Cindy is the consummate professional and so incredibly talented and passionate about her work. We sing her praises on a regular basis as we are enjoying our new space and would recommend her to anyone.